On November 3rd, 1983, President Ronald Reagan officially declared Martin Luther King Jr. Day a federal holiday to be celebrated near MLK’s birthday on the third Monday of January, beginning in 1986. Today marks the 33rd year of nationally honoring King’s legacy as a leader in the civil rights movement while ignoring his extramarital affairs, socialist leanings, and support for population control. Though MLK famously said that he dreamed of a world where his children “will not be judged by the color of their skin but by the content of their character,” those who support his message strangely push policies that do the exact opposite, leaving one to question the original intention of his message. Affirmative action in school admissions, scholarship opportunities strictly for minorities, and diversity hirings to meet racial quotas are now common practice. Still, SJWs complain about the seemingly endless instances of systemic oppression experienced today by People of Color (not colored people, that’s offensive), while unable to specify any law or institutional practice that is actually racist against them. With any luck, tomorrow’s “National day of Racial Healing” is sure to mend racial tensions, and Penn State has their own line-up planned, an entire week dedicated to the commemoration of MLK. 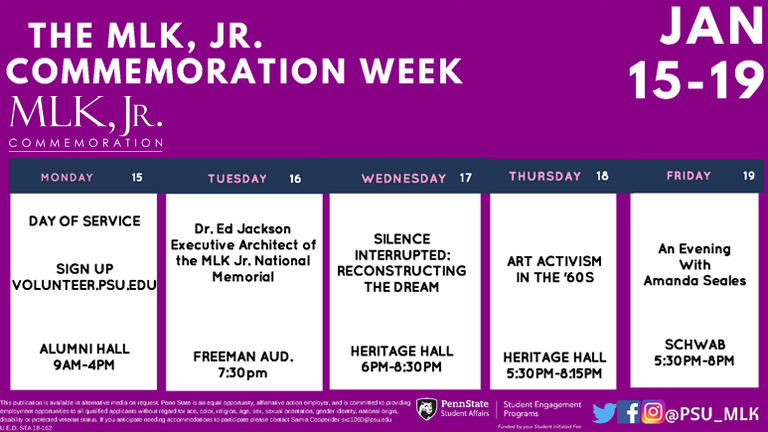 Requiring year-long planning, it’s own website and social media accounts, and large numbers of student volunteers, MLK, Jr. Commemoration Week 2018 is focusing on the theme of “Deconstructing the Dream: At Whose Expense?” Details of the week’s events can be found below, with the purpose of each, and the week’s theme as a whole, up to anybody’s interpretation. Today’s Day of Service is a common event held on MLK day nationwide, but the rest of the week’s events seem to focus more on skin color than character content. The main event of the week seems to be the final one, “An Evening with Amanda Seales” held at 5:30 PM on Friday in Schwab Auditorium. A seemingly unfunny comedian who focuses on “hot topic” issues like, you guessed it, racism, Seales has a masters degree in African-American studies from Colombia University, and you can find out more about her “character” here.